A “Good Life” is an aspiration worth pursuing for everyone. Apart from emotions & values of Life that can’t be traded, our mission is to get you products and services that can provide maximum value towards your hard earned money and contribute to make your Life Good. GoodLife.com ships its products to almost all parts of India. Orders placed will be shipped within 24 hrs. We ship on all days except Sunday and National Holidays. We provide Free Shipping on all Orders of Rs.350/- or more. For Orders below Rs.350, shipping charges of Rs.50 will apply. For all areas serviced by reputed couriers, the delivery time would be within 3 to 4 business days of shipping (business days exclude Sundays and other holidays). In case you find any problems, damages or defects in the products you can simply return the product to us within 7 days of receiving the product. On Successful processing of returned Item(s), we will either replace the product or refund the entire amount. Goodlife.com does not allow returns on the following. Cosmetics, Fragrances & deodorants will not be returnable unless containing a manufacturing defect that can be proved. Refund of return shipping charges (Charges paid by the user for sending the products to us) will be limited to Rs 100 or 10% of product cost, whichever is lower. The refund for shipping charges will be in the form of Gift voucher. Please note that the product should be unused with all original tags intact and should be sent back in original packaging with a copy of original invoice. I have chosen this website to shop because this online shop contains all range of products in so many brands, it was very easy to search things and order for me. The shipping charge is 50rs only for the orders below 350rs, this sounds good for me when compared with other sites. I have ordered these things last week Friday morning and confirmed the order immediately, because it is a COD order, I always prefer COD only. I got sms and mail confirmation immediately from them, later email follow ups for tracking my order. I felt it was bit slow in shipping things; I got the stuffs Tuesday only. But it is not their fault as they mentioned they will ship within 3 to 4 days and they did it exactly. I always want to get my stuffs within two days like how slassy and jabong delivers things. I am quite satisfied by the package, they are bubble wrapped and well packed, No damage issue and all. I will shop with this site again if I couldn’t get any stuff in my favourite online shops, like this is a second choice for me. Easy to search and order things. 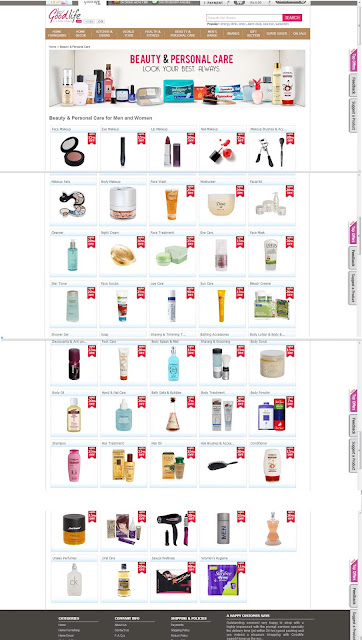 Variety of Beauty brands available. All price range of products available. Great packing and bubble wrapping things safely. Delivery of all products at one time. Actually nothing and I wish the deliver could be within 2 days L.
Goodlife.com is a great online shopping website to shop wide range brands easily, Girls do try once their packaging, tracking info and delivering things in time are good. What is your favourite online shop??? Nice regiew Radha and you are lucky you got your stuff safe and intact. It used to be a good business more than a year ago but presently the service and packing are third grade. I had to get 5 consecutove orders reimbursed because of packing and damage issues and near expiry products. Finally i gave up. yes im from chennai wat abt u? kool review radha :) i'm yet to try khadi products.. I bought from them, and got a Rs 85 item slightly damaged. I sent them a picture and they said it was out of stock, so I said please send ANYTHING for Rs 85 - they sent me a replacement for Rs 100!!! That is great customer care. Compare it to horrible BeautyKafe who refunded Rs 500 less because their courier lost my item and sent a voucher instead! Wow this site sounds good! Those soaps are looking refreshing! nice post sis :)am waiting for the reviews..
You always purchase interesting and nice things, the soaps look great, xoxo.